Edward Lear, Porto Tre Scoglie, Albania. This view was made by Lear in April 1857 on a short trip to Trescogli (modern Ksamili) to the north of Butrint in Albania. Lear sailed from Corfu where he had taken a house for the winter. Butrint was an ancient Greek and later Roman city, now under excavation. ‘We were off on the 2nd April in Lushington’s boat Midge – I taking George, the canteen or box of cooking things, my bed, paper for drawing, etc., & Edwards taking his servant, Fillipo (a Maltese). We had a perfectly quiet passage across of only 3 hours & anchored in the little harbour of Trescogli – enjoying all the afternoon on making drawings – below the tall white heath all in bloom – & comfortable dinner & quiet night’ (Edward Lear, The Corfu Years, Athens and Dedham, 1988, p. 108). The trip was taken with James Bevan Edwards (1834-1922), later a senior British army officer and politician, who was the son of Samuel Price Edwards, a keen patron of Lear’s whose collection of works included Corfu, from Ascension (1859, sold in these Rooms on 16 December 2015, lot 128), Petra, The Theatre (1859), Turin (1862) and Jerusalem (1862, Ashmolean Museum, Oxford). Lear made his first expedition to Albania between September and November 1848, an area that few foreigners had ever explored. He found the area fascinating: ‘You have majestic cliff-girt shores; castle-crowned heights, and gloomy fortresses; palaces glittering with gilding and paint; mountain-passes such as you encounter in the snowy regions of Switzerland; deep bays, and blue seas with bright, calm isles, resting on the horizon; meadows and grassy knolls; convents and villages; olive-clothed slopes, and snow-capped mountain peaks; – and with all this a crowded variety of costume and pictorial incident such as bewilders and delights an artist at each step he takes’ (E. Lear, Journals of a Landscape Painter in Albania, London, 1851, pp. 4-5). 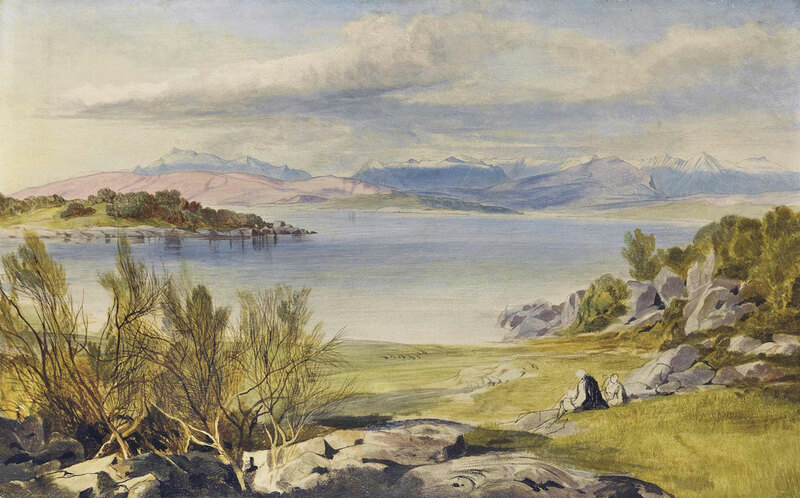 This entry was posted in Edward Lear and tagged Albania, Edward Lear, landscape, oil paintings, travel. Bookmark the permalink.